Theseus’ victory over the Minotaur is one of the best-known exploits of the Greek heroes, on a par with the Twelve Labours of Hercules. 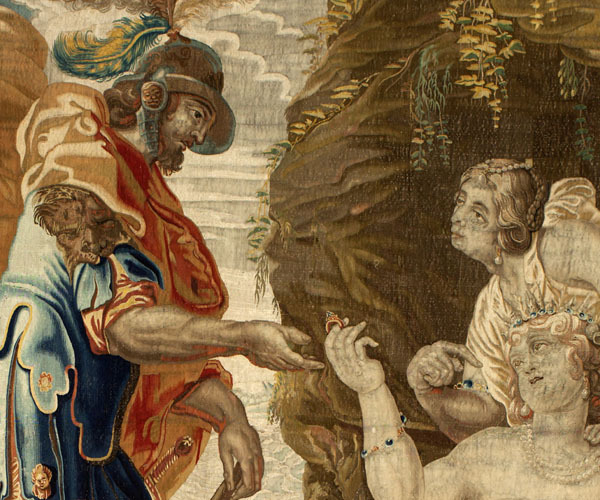 This series recounts the famous story over nine tapestries in silk and wool, manufactured by Jan Raes the Younger around 1630 and acquired by King Philip IV in 1636. 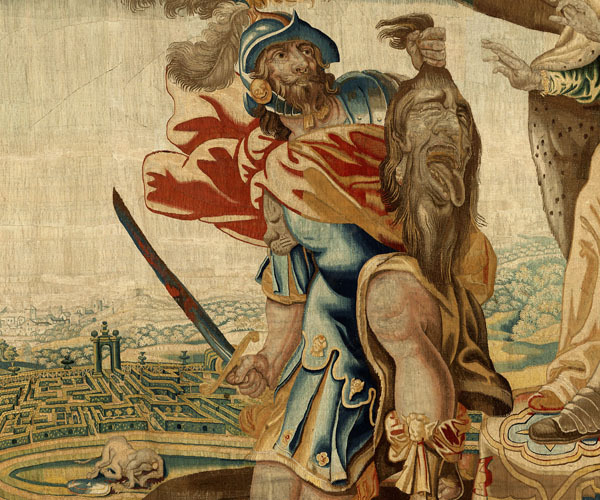 Some tapestries are kept today in the Spanish embassies in Lisbon and Washington, and four displayed in the Royal Palace of El Pardo. The Spanish National Heritage Collection holds two series telling the story of the Athenian hero Theseus. 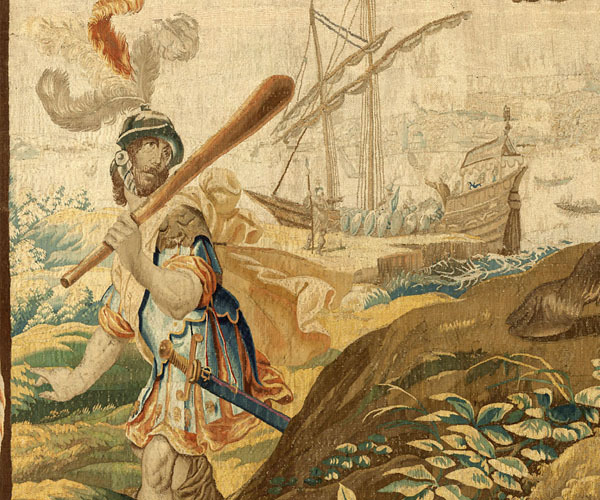 Both were weaved from cartoons produced by Anthonis Sallaert, a painter in Brussels, at the end of the 1620s. The artist was particularly influenced by the cartoons produced by Rubens around 1626 for the series The Eucharist, the first version of which is kept in the Descalzas Reales convent in Madrid. 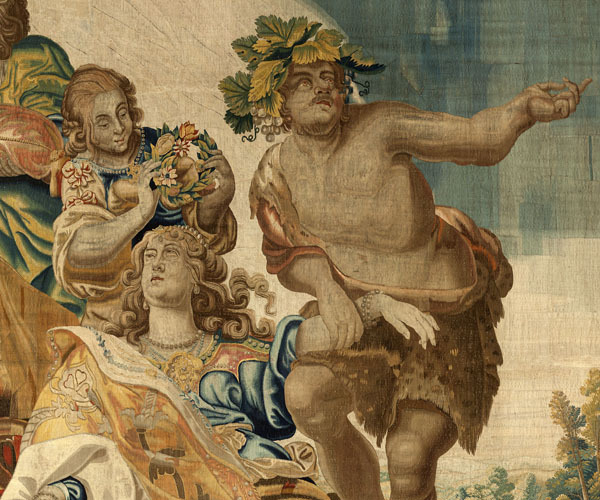 Sallaert reproduced two of Rubens’ techniques with great success: firstly, the use of sotto in sù (literally “seen from below”, a technique using foreshortened figures to create the perception of true space); and secondly, the framing of the tapestries with grand Solomonic (also known as “barley-sugar”) columns. The name of Jan Raes the Younger, who was commissioned to manufacture the series, appears on several pieces: “IAN RAES LE IEVSNE”. The story of Theseus is taken from Plutarch’s Parallel Lives, in which the life of the Greek hero is presented alongside that of Romulus, the founder of Rome. 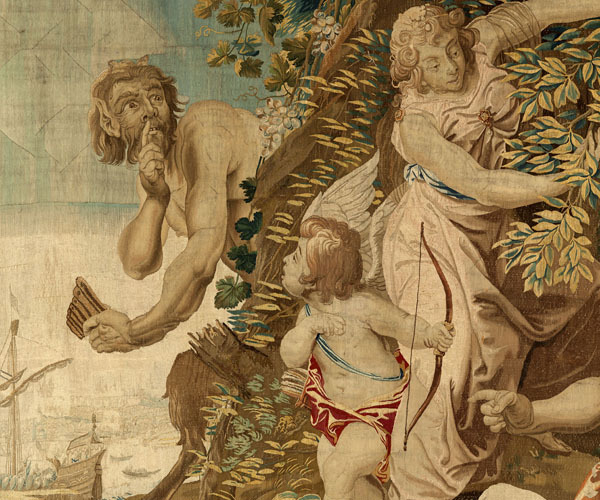 Despite the attention it has received in literature, the tale has only rarely been used in tapestries (one hanging is kept in the Uffizi Gallery in Florence), making all the more exceptional the two series held by Spain’s National Heritage. Theseus was still a little child when his father, Aegeus, ordered that he be kept away from Athens. The child was brought up by his mother, Aethra. When he reached adulthood, Theseus rolled away a heavy rock under which his father had placed his sandals and sword years ago. The hero then made his way to Athens. Aegeus, unaware that the stranger arriving in Athens was his son, made him fight with the Marathonian Bull to prove his worth. Theseus defeated the bull. Now recognised by his father, Theseus asked permission to travel on the expedition to Crete, where seven Athenian boys and seven Athenian maidens were sent every year to be devoured by the Minotaur. During the journey, Theseus declared himself son of Poseidon, and, in order to prove his claim, had to find a ring which King Minos of Crete had thrown into the sea. Theseus dived into the water and, aided by dolphins, found Amphitrite, the wife of Poseidon, who handed him the ring. Once in Crete, Ariadne, the daughter of Minos and Pasiphaë, fell in love with Theseus. She gave him a ball of thread to tie to the entrance of the Labyrinth and unroll as he went along, so that he could find his way out. He found the Minotaur, killed it, and made for Athens with Ariadne, who he then abandoned on the island of Naxos. Although grief-stricken and despairing, she soon married the god Dionysus-Bacchus. Meanwhile, Theseus, approaching Athens, had forgotten to change the black sails of his ship for white ones. The distraught King, believing his son to be dead, threw himself into the sea which now bears his name. P. Junquera de Vega and C. Díaz Gallegos, Catálogo de tapices del Patrimonio Nacional. Volumen II: Siglo XVII, Madrid: Patrimonio Nacional, 1986, pp. 117-126. C. Herrero Carretero, “Tapisseries royales espagnoles de la maison de Habsbourg et acquisitions flamandes de la maison de Bourbon”, in Tapisserie au XVIIe siècle et les collections européennes, Chambord, 1999, pp. 103-112.